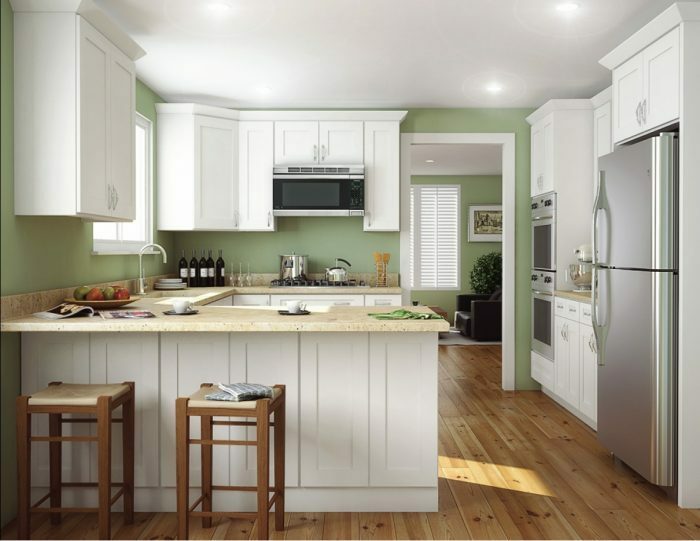 Remodeling your home can be fun but full of decisions! 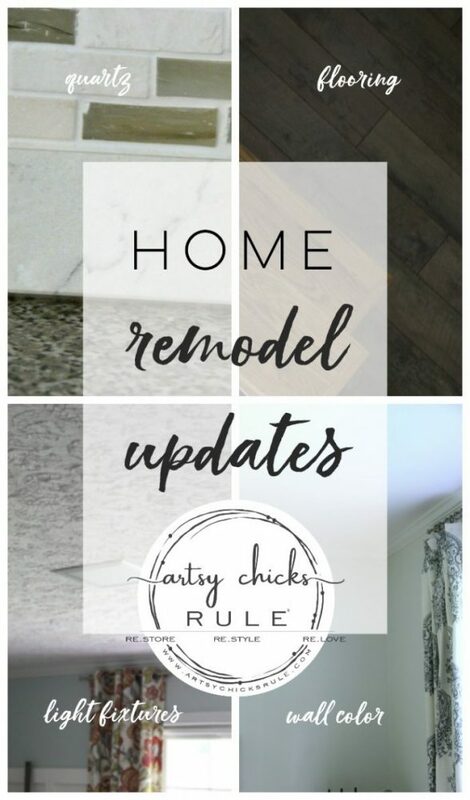 I’m sharing some of our home remodel updates (and our decisions) with you today. This is a work in progress, y’all! It’s tough living in the house while you are doing these things. Especially replacing an entire first floor flooring. AND a full kitchen remodel. That’s like moving! I have lots of plans for the new design of the home, the way the rooms are being used and new decor. I’ll share more on that after the remodeling part is done. Okay, let’s start with the paint color I finally settled on. 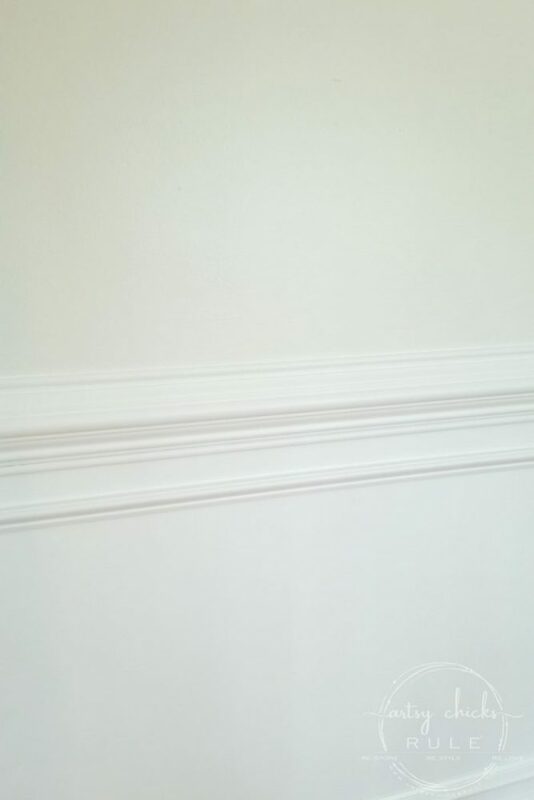 Benjamin Moore – Pure White. I am so thrilled with this “color”. And I say color but it’s not really. It’s so soft with it’s hues. 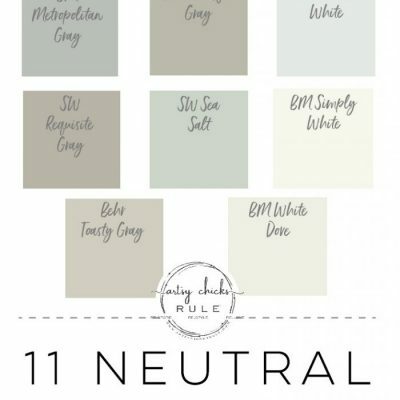 It is in the “off white” family per Benjamin Moore. I would call it a very soft, slightly warm gray. I’m not really a gray fan so you might guess it doesn’t really look like “gray” paint. 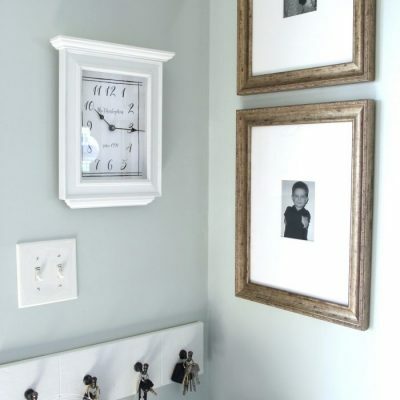 It is very subtle, looks great with just about everything, including the SW Sea Salt in adjoining rooms and gives just enough color to make the white trim work pop. As a reminder, here is what it looks like. It’s very hard to photograph and actually get the color accurate. I’ll share more photos once I have the rooms complete. I’m thrilled to be partnering with Select Surfaces on our flooring. But here’s a little something I need to work on…..
As much as I hate to, I *think* I have decided to paint them white and put a nice runner down the middle to tie in the floor. Would love your thoughts on this and/or any other ideas on this you’d like to share! 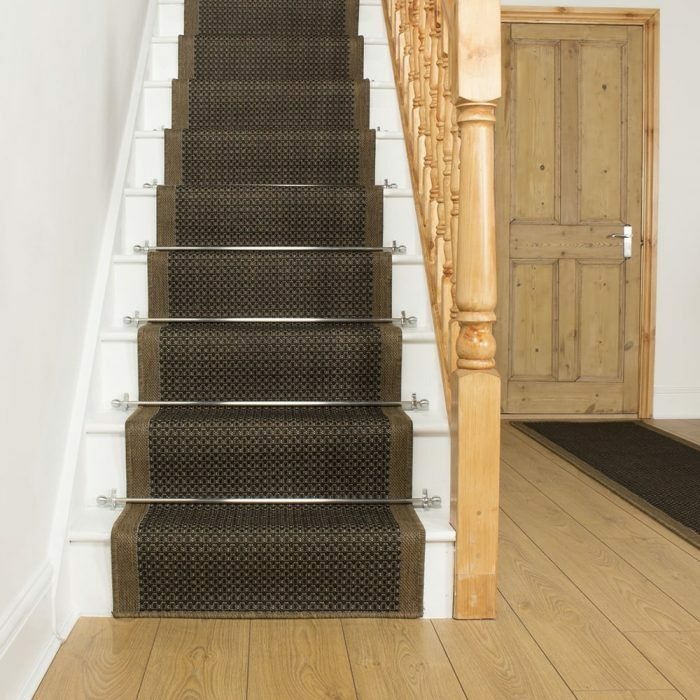 White painted stairs with a dark brown/tan runner. I think this will look really nice with the new flooring. What ya think? 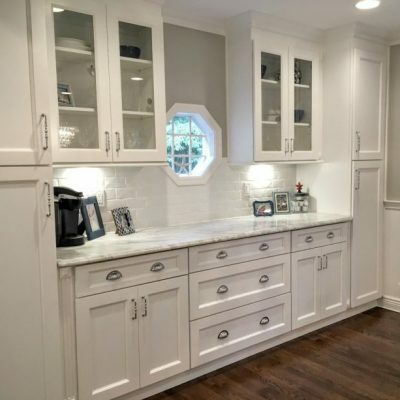 We are going with a white shaker style cabinet like these above. We were going to do “ready to assemble” cabinets that we would put together ourselves to save a bit. But with all that we have going here, we decided to go with pre-assembled instead. 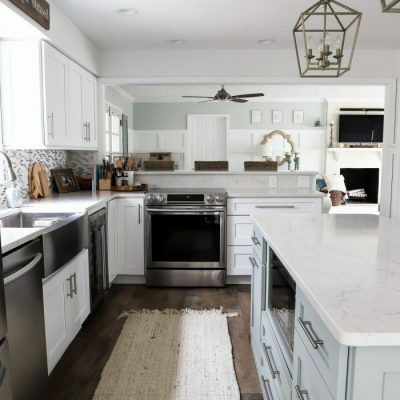 I think that was a good choice for us since we have so many things going at once, BUT it is a good way to save when doing a kitchen remodel. I’m undecided on hardware and the sink. 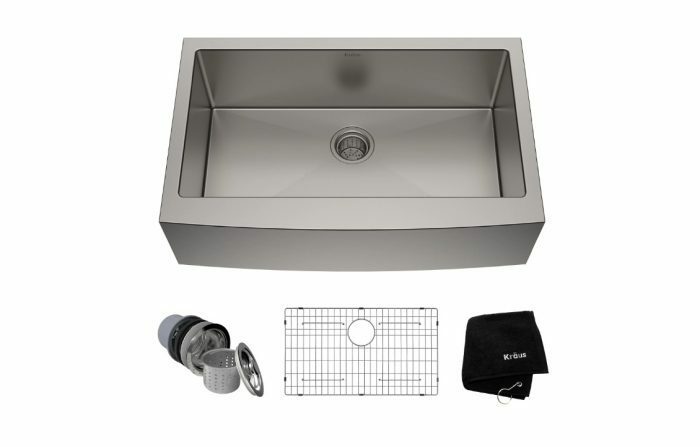 We currently have an IKEA sink that sits on top of the counter and we would like to get one that is an undermount. So that one will be going. We got this sink from Amazon, here. Stainless farm/apron sink for a little something different. 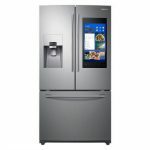 Oh my, it’s only a little frustrating that we bought a new range and refrigerator in the last 2 years…in BLACK. 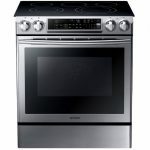 And in black because we had black appliances already and were buying new to match existing and the black granite top on the island. Hahaha….oh well! That’s how things go sometimes. This is what we chose…..
We bought a Samsung washer and dryer a couple years ago and just love them both. 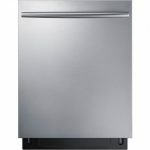 And talking about appliances, >>> when we gave our kitchen it’s first remodel, we had a trash compactor to replace. We decided to put a wine cooler in that spot. Since we weren’t tearing out cabinets, we had to find a wine cooler to fit the same size as a trash compactor. 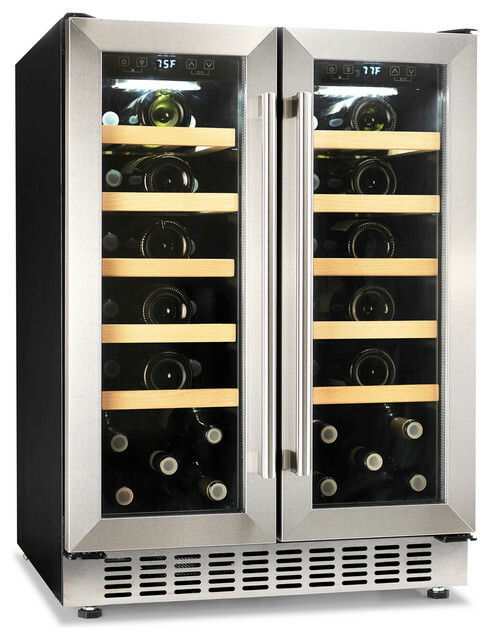 But since we are now doing a full-on kitchen remodel, we can put in whatever size wine cooler we would like. So we decided to go with this…. I’m excited about this one because I will have two separate sides for temperature variations, one for reds and one for whites. Our kitchen layout will basically be the same with just a few small adjustments like this one that allows for a larger wine cooler. 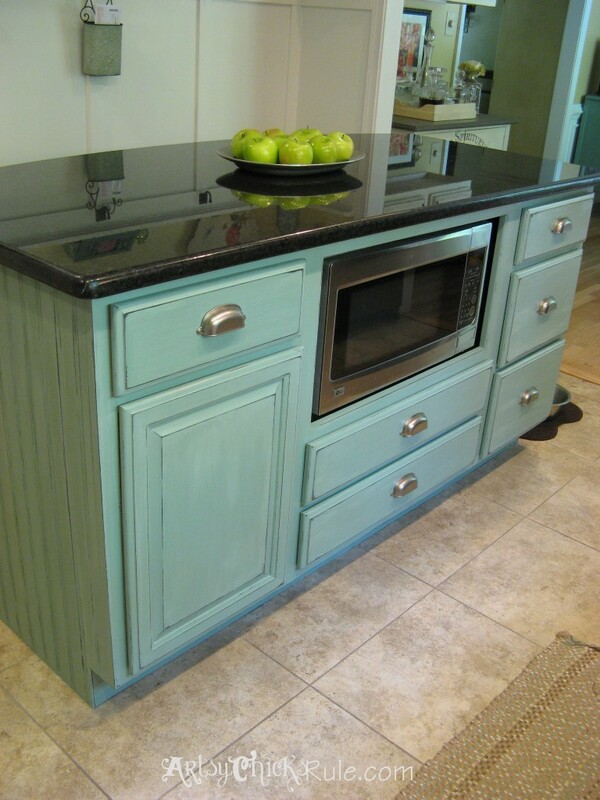 Our >>> kitchen island is getting a makeover too. We decided not to replace it with new cabinets because my husband and I built this from big box store cabinets about 8-9 years ago, so it’s not very old. Plus it’s in very good shape so there really was no need. It doesn’t match the style cabinets we are getting but I’m okay with that since it’s also not going to match in paint color either. We added bead board siding to the sides back when I gave it a paint makeover. That’s gonna go and we are going to install shiplap around the sides and back instead. AND it’s getting a new paint job. And, it’s going to have a white counter top. No more black granite, that’s going bye-bye. And with that, let’s talk counter tops. One of the other quartz counter tops I mentioned previously ended up having a bit too much black in the large sample I saw. And then I found this beauty. It’s “white” and bright without being too white and too in-your-face bright. 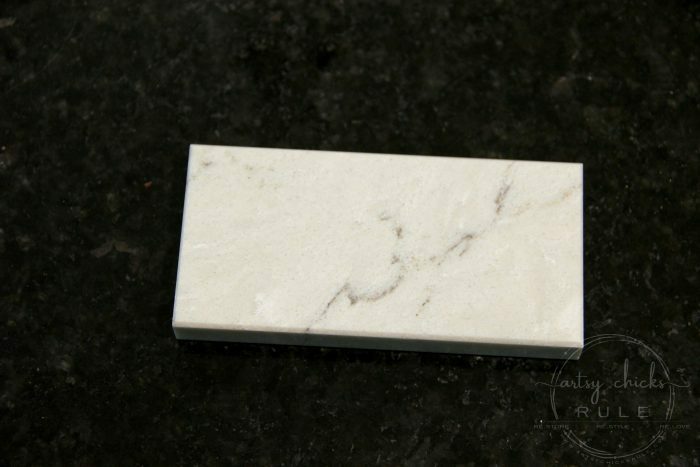 It has gorgeous, subtle veining and little bright white specks. I just adore it. 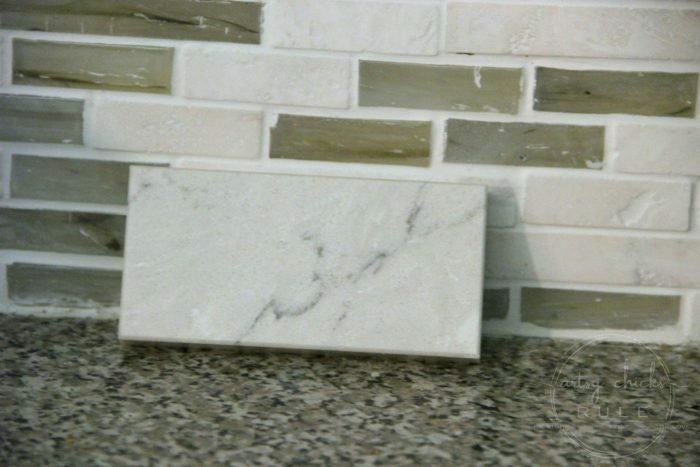 Looks great with our tile back splash too. Lighting in the family room. When you buy an older home, you end up having older quirky things like trash compactors….and lights like this….. I know many like those, but they are just not my preference. I like a nice, smooth ceiling. We have considered scraping the ceiling but honestly, no. We just have too much going on around here to add one more thing. 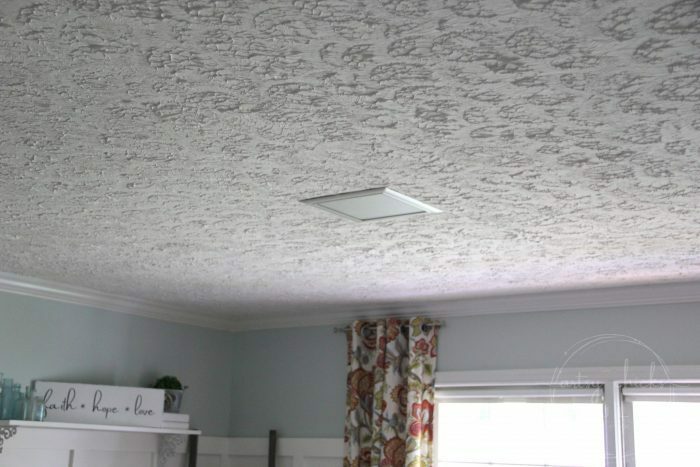 We thought about putting in flush mount ceiling fans but are undecided. However, we are still leaning towards them. I also found these two light fixtures that will fit (cover up!) “the square” we have there. Sort of undecided between these round ones or these semi square ones? The round ones might be neat because, to me, they have a sort of coastal feel to them. Almost like “port holes” or something. Either way, something else is going in there. I have to tell you though, one of the bulbs in one of these light fixtures in this room has never been changed…by us anyway…in the 14 years we’ve lived here! We are about 1/3 of the way finished with the flooring so have a little bit of a ways to go there. It’s coming along nicely though! I’ll be back later this week with a project that I really enjoyed creating. Wow, Nancy! Things are looking great! You have made some really awesome choices! 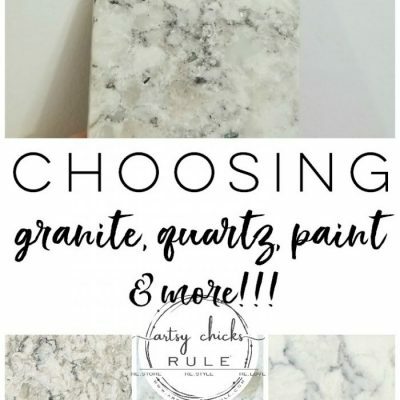 And your kitchen is going to look fabulous! And since you asked, I, personally, prefer the round light fixture. Hadn’t even thought of it being like a little porthole, but that is a cute analogy! 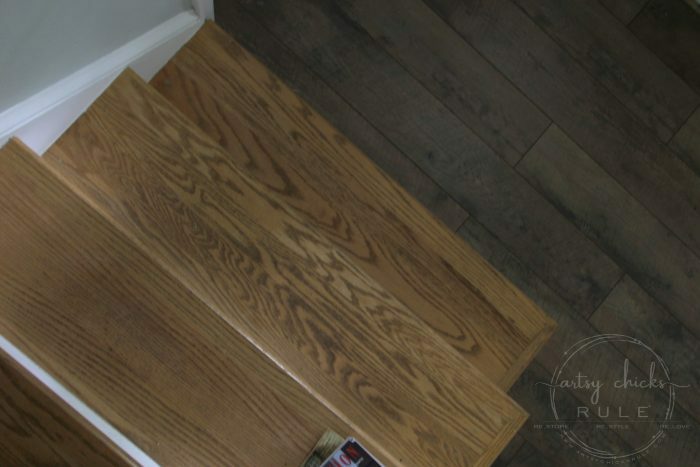 Oh, and I like the idea of of painting the stairs and using a runner. I think that would add a cozy feel, besides looking really nice. Living in a home during a remodel is definitely a challenge!! I love so many of your choices, we used sea salt, have Samsung appliances , and shaker cabinets! 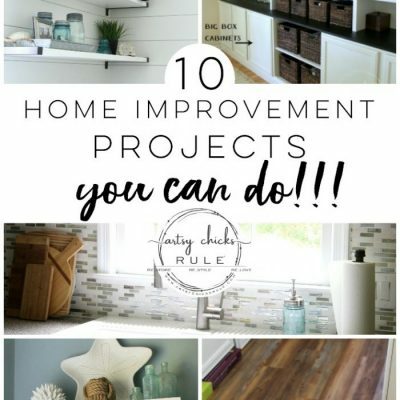 I felt like I was reading about my remodel :) great work! Can’t wait to see it all done. Man, you have A LOT to think about and plan! Love the plan for the stairs! Perfect, I think! Your kitchen is going to be SO PRETTY! So happy and excited for you, Nancy! The photos you took of the OBX are fabulous.